Minecraft is an incredible game. The game's very popular all over the world. However, most of you guys think, that Minecraft is only PC (or XBOX). However one dedicated Minecraft player out there wanted to play his favorite game EVERYWHERE, that is why he decided to make a Minecraft for PSP (Sony Playstation Portable) console! Minecraft for PSP is absolutely free to download in our website Minecraft Blocks. Minecraft for PSP is free to play unofficial Minecraft conversion created to play on portable PSP system. 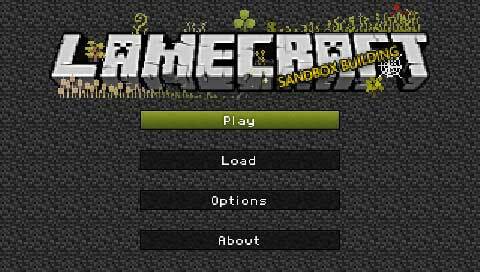 You can download Minecraft PSP version and and play it for free! A Minecraft for PSP is called Lamecraft and it is basically classic Minecraft mode, a little bit simplify compared to official Minecraft game for PSP. You can everything as you can do with standard Minecraft game. We recommend for all Minecraft fans, who own a Sony PSP Playstation Portable console.